Richard Paul Astley (born 6 February 1966) is an English singer, songwriter and radio personality. His 1987 song "Never Gonna Give You Up" was a number 1 hit single in 25 countries and won the 1988 Brit Award for Best British Single. By the time of his retirement in 1993, Astley had sold approximately 40 million records worldwide. Astley made a comeback in 2007, becoming an Internet phenomenon when the music video for "Never Gonna Give You Up" became integral to the meme known as "rickrolling". Astley was voted "Best Act Ever" by Internet users at the MTV Europe Music Awards 2008, and his 2016 album 50 debuted in the UK at No. 1. Astley was born on 6 February 1966 in Newton-le-Willows in Lancashire, the fourth child of his family. His parents divorced when he was five and Astley was brought up by his father. Astley remained in very close contact with his mother, who lived a few blocks away from his father. After finding out that his father was the one who kicked his mother out of the house, Astley distanced himself from his father. His musical career started when he was 10, singing in the local church choir. During his schooldays, Astley formed and played the drums in a number of local bands, where he met guitarist David Morris. After leaving school at sixteen, Astley was employed during the day as a driver in his father's market-gardening business and played drums on the Northern club circuit at night in bands such as Give Way – specialising in covering Beatles and Shadows songs – and FBI, which won several local talent competitions. In 1985, Astley was performing as a drummer with a soul band named FBI, with Morris on guitar. They were a well-known local band writing and performing their own music, gigging in pubs and clubs. When FBI's lead singer left the band, and Morris left to concentrate on his career in hairdressing, Astley offered to be the lead vocalist. This was when he was noticed by the record producer Pete Waterman, who persuaded him to come to London to work at the Pete Waterman Limited (PWL) recording studio, with RCA Records publishing his records. Under the tutelage of the production team of Mike Stock, Matt Aitken and Pete Waterman, known as Stock Aitken Waterman (SAW), Astley was taught about the recording process and groomed for his future career, supposedly starting off as the recording studio "tea boy". The reason for Astley to be hired as a "tape op" was to overcome his shyness. SAW also hired most of FBI, including Morris as a guitarist/songwriter. His first single was the little-known "When You Gonna", released as a collaboration with Lisa Carter, with little promotion. It did not chart. His first solo offering was "Never Gonna Give You Up", recorded on New Year's Day 1987, and released eight months later, in August. Astley's distinctive rich, deep voice combined with dance-pop, made the song an immediate success, spending five weeks at the top of the British charts and becoming the year's highest-selling single. The song was also a worldwide number one hit, topping the charts in 24 other countries, including the US, Australia, and West Germany. It would become the first of 13 (worldwide) top 30 hit singles for him. "Never Gonna Give You Up" won Best British single at the 1988 BPI awards (now called the BRIT Awards), and he performed the hit in front of a global audience of 100 million. His next single was "Whenever You Need Somebody", which was released in October. The single was a recycled Stock, Aitken, Waterman song, originally recorded by O'Chi Brown in 1985. It became a successful European hit, reaching No 1 in seven countries, including West Germany and Sweden, following up the success of his debut single. It also reached No 3 in the UK. It was not released in North America. In December 1987, Astley released a cover version of the Nat King Cole classic "When I Fall in Love". This single is mainly remembered for a closely fought contest for UK Christmas Number 1. Rivals EMI, hoping to see their act the Pet Shop Boys reach No 1, re-released the version by Nat King Cole. This led to a slowdown of purchases of Astley's version, allowing the Pet Shop Boys to reach the coveted top spot with their cover version of Always On My Mind. Despite selling over 200,000 copies and gaining a Silver certification from the BPI, it peaked in the UK at No 2 for two weeks. The re-release of Nat King Cole's version reached No 4. The B side was a dance number "My Arms Keep Missing You", which was successful in mainland Europe. Astley's fourth single release would be "Together Forever" in 1988, reaching No 2 in the UK. It was denied the top spot by Neighbours sensation Kylie Minogue's debut "I Should Be So Lucky". "Together Forever" was more successful in the US, topping the charts, making it his second US chart topper. In 1989 he was nominated for a Grammy Award for Best New Artist, but lost to Tracy Chapman. His fifth and final release from his debut album was "It Would Take a Strong Strong Man". It was a more soulful song, when compared to his other releases, and was mainly intended for the North American market. Thus, it was not released in Britain. It was another hit for Astley, reaching No 10 on the US Billboard Hot 100, and No 1 in Canada. During the period between his debut release and his fifth single, Astley outsold every other artist in the world. In the UK, he was in the Top 40 every week for the first 6 months of his career. A fire in the PWL studios destroyed much of Astley's new material, causing a delay in the release of his second album. Hold Me in Your Arms was released in January 1989, containing five singles, and reached No 8 in the UK and No 19 in the US, being certified platinum in the UK and gold in the US. Astley's relationship with British media deteriorated significantly after the release of Whenever You Need Somebody, with the media calling him a "puppet" of Stock Aitken Waterman, although Astley had written five of his new album's tracks. The negative press inevitably affected the sales of his singles. The first single from the album to be released was "She Wants to Dance with Me", a number written by Astley. It was another successful single, reaching No 6 on both the UK and US charts. "Take Me to Your Heart" was the next single to be released from the album. It reached No 8 in the UK and was not released in the US "Hold Me in Your Arms", a ballad written by Astley, reached No 10 in the UK and was also not released in North America. The next two singles released from the album were intended for the North American market. "Giving Up on Love" and a cover of The Temptations song "Ain't Too Proud To Beg" charted at No 38 and No 89 in the US respectively. He achieved one more major success with the 1991 ballad "Cry for Help", which reached No 7 in both the UK and the US. The other two singles from Free were not as successful. "Move Right Out" reached No 58 in the UK and No 81 in the US; and "Never Knew Love" reached No 70 in the UK and did not chart in the US. 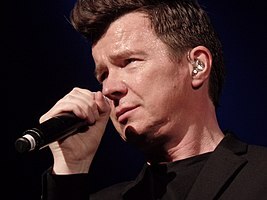 Free would mark the end of Astley's successful period, and "Cry for Help" would be the last Astley single to make the Top 10 in either the UK or US to date. His next album, Body and Soul, was released in 1993, and was largely an Adult Contemporary album. By the time the album was released, Astley had decided to retire from the music industry. As a result, the album did not get a lot of promotion, not charting in the UK but managing to make the Billboard 200, peaking at No 182. The two singles, "The Ones You Love" and "Hopelessly", performed very well on the US adult contemporary chart, peaking at No 19 and No 4 respectively. "The Ones You Love" peaked at No 48 in the UK but did not chart in the US. "Hopelessly" also crossed over and peaked at No 28 on the US Billboard 100, staying in the US top 40 for five weeks, and No 33 in the UK. It was named as one of the most performed songs at the 1994 BMI Awards, and is one of the few songs to achieve BMI 'Million-Air' status. After 1993, Astley retired from the music industry at the age of 27, deciding that family life was more important. During Astley's time out of the music business, he raised his daughter Emilie, born in 1992. Thus, for much of the 1990s and early 2000s, Astley remained largely out of the spotlight. Astley would later state that this was due to his growing frustration with the business side of things. During this period he co-wrote "Mission Statement", a track for former Marillion singer Fish's 1999 solo album Raingods with Zippos. Almost 10 years after Body and Soul, Astley returned to the music industry, signing a co-publishing deal with Polydor and releasing Keep It Turned On in 2001. The album featured the single "Sleeping", which became a minor club hit, thanks to a set of remixes from US house producer Todd Terry. Keep It Turned On was only released in Continental Europe. Astley's first compilation album, Greatest Hits, was released in 2002, and reached No 16 on the UK Albums Chart. With no promotion from Astley, it sold over 100,000 copies and was certified Gold by the British Phonographic Industry. In 2003 he charted at No 10 in the UK as a songwriter with "Shakespeare's (Way With) Words" performed by short-lived boy band One True Voice. In 2004, Astley toured for the first time in 14 years, which led him to a record contract with Sony BMG. In March 2005, Astley released the album Portrait, in which he covered many classic standards such as "Vincent", "Nature Boy" and "Close to You". Astley and Sony BMG were unhappy with the result so the album was poorly promoted, yet it managed to reach No 26 on the UK Albums Chart. In April 2008, the album The Ultimate Collection: Rick Astley was released by Sony BMG, and by early May it had reached #17 on the UK Top 40 Albums Chart, again with no promotion by Astley. In September 2008, Astley was nominated for the 'Best Act Ever' award at the MTV Europe Music Awards. The push to make Astley the winner of the award continued after the announcement, as did efforts to encourage MTV to invite Astley to the awards ceremony. On 7 November, following a massive Internet campaign by fans, Astley won the award in Liverpool, but was not there in person to receive it. Perez Hilton collected the prize on his behalf. On the back of this, "Never Gonna Give You Up" returned to the UK charts, over 21 years after it was released, peaking at No 73 during the Christmas period. During the late 2000s, Astley continued touring across the globe, touring with various other 1980s acts, such as Boy George and Belinda Carlisle, in the Here and Now Tour. In April 2009, he wrote an article for Time about moot. Astley was a special guest throughout Peter Kay's new tour, The Tour That Doesn't Tour Tour...Now On Tour, from 27 April to 22 May 2010. To mark the occasion, Rick Astley released a new single "Lights Out" on his own label on 7 June 2010. This was Astley's first release in the UK Singles Chart in 17 years. It was well received by radio, peaking No 15 on the UK Airplay Charts, but it failed to become a commercial hit, reaching only No 97 on the UK Singles Chart. During the summer of 2010, Astley became a radio DJ for London's Magic FM, presenting a Sunday show. The initial contract was for eight weeks, but he proved popular with listeners and his contract was extended till the end of the year. In December 2010, Astley co-hosted the Chris Evans Breakfast Show on BBC Radio 2 with Peter Kay, and in March 2011 appeared in Comic Relief's Red Nose Day telethon on the BBC. In April 2016 Astley released "Keep Singing", from his forthcoming album, 50. Interviewed by Amanda Holden on the Lorraine show on 7 April, Astley explained that it was turning 50 which had prompted him to release the single. He said, "It was a big milestone. I got back in the studio and friends were telling me the material I was working on was pretty good. So I decided to go for it." On 31 May, the release date for Astley's 50 was revealed to be 10 June 2016. The album reached number one on the Official UK Album Sales charts in the week of 17 June 2016 to 23 June 2016. In September 2016 Astley released the single "Dance", together with an official video. On 1 June 2018, Astley posted a video on Twitter announcing his upcoming album Beautiful Life set for release on 20 July. Astley has also released a single of the same name. Astley is also doing a tour titled #BeautifulLife Tour and tickets were first available for purchase to anyone who pre-ordered the album. Beautiful Life ended up being released earlier than previously said, with its release date on 13 July 2018. In 2007, Astley became the subject of a viral Internet meme known as rickrolling. In this prank, Web users are tricked into seeing Rick Astley's video "Never Gonna Give You Up" when they follow a link that claims to be something else. Views of this video on various websites are now in the hundreds of millions. The phenomenon became so popular that on 1 April 2008, YouTube pranked its users by making every single featured video on its front page a rickroll. 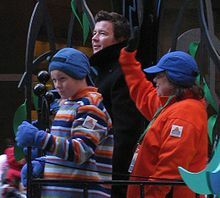 On 27 November 2008, Astley participated in a live rickroll during the Macy's Thanksgiving Day Parade, while the Foster's Home for Imaginary Friends characters were singing "Best Friend", the theme from the 1970s TV series The Courtship of Eddie's Father. Midway through the song, Astley emerged from the float and began to lip sync his signature hit. At the end of Astley's performance, Cheese (a character from Foster's) shouted out "I like rickrolling!" Although the video garnered millions of hits on YouTube, Astley has earned almost no money from the meme. By 2010 he had received only US$12 in royalties from YouTube for his performance share. Astley has denied these reports. Astley is married to Lene Bausager and the couple have a daughter, Emilie, who was born in 1992. Astley met Lene when she was working as a promoter with RCA in 1988. Lene is a film producer, and was nominated for the 2006 Academy Award for Best Live Action Short Film for the Sean Ellis film Cashback, on which she was the main producer. The family lives in the London suburb of Richmond. ^ "Biography". Mike Stock Music. Archived from the original on 3 October 2011. Retrieved 11 June 2013. ^ US (29 July 2008). "Rick Astley". MySpace.com. Retrieved 11 June 2013. ^ Shropshire Star.com – 7 June 2008. Retrieved 28 January 2010. ^ Liverpool Echo – 12 November 2007. Retrieved 28 January 2010. ^ a b "Astley shortlisted for MTV award". BBC News. 2 October 2008. Retrieved 22 November 2008. ^ a b Savage, Mark (17 June 2016). "Resurgent Rick Astley tops UK album chart". BBC News. bbc.com. Retrieved 20 June 2016. ^ a b "Rick Astley: The pop idol returns". London: The Independent. 13 October 2005. Retrieved 16 May 2010. ^ Barber, Richard (23 June 2018). "I was embarrassed being a millionaire at just 22". Express.co.uk. Retrieved 3 September 2018. ^ a b "Rick Astley – About". lookstudio.com. Archived from the original on 5 February 2002. Retrieved 16 May 2010. ^ a b c "MP David Morris on his journey from pop to politics". BBC. 2 March 2011. Retrieved 2 March 2011. ^ "YouTube – Rick Astley Interview in 1987 (TVam) (1987)". www.youtube.com. Retrieved 14 May 2010. ^ "YouTube – Rick Astley – Never Gonna Give You Up (1987)". www.youtube.com. Archived from the original on 12 February 2010. Retrieved 11 February 2010. ^ "allmusic – Rick Astley – Overview". allmusic. Retrieved 14 May 2010. ^ "YouTube – Rick Astley – Never Gonna Give You Up (live) 1988". www.youtube.com. Archived from the original on 3 August 2011. Retrieved 17 May 2010. ^ "Discography – Whenever You Need Somebody". www.rickastley.co.uk. Archived from the original on 13 April 2010. Retrieved 15 May 2010. ^ "The Ultimate Collection by Rick Astley". itunes.apple.com. Retrieved 15 May 2010. ^ "Discography – When I Fall in Love". www.rickastley.co.uk. Archived from the original on 19 April 2010. Retrieved 15 May 2010. ^ "Certified Awards Search". BPI. Archived from the original on 17 January 2010. Retrieved 15 May 2010. ^ "Singles Chart 12/03/88". chartstats. Retrieved 15 May 2010. ^ "Ask Rick Astley". Sunday Sun. Retrieved 15 May 2010. ^ "Discography -Hold Me in Your Arms". www.rickastley.co.uk. Archived from the original on 27 July 2010. Retrieved 15 May 2010. ^ "The Eighties Club". Eightiesclub.tripod.com. Retrieved 11 June 2013. ^ "BMI Million-Airs". Chartts.tripod.com. Retrieved 11 June 2013. ^ a b Agius, Nicola (7 April 2016). "Eighties legend Rick Astley, 50, wows fans - including Amanda Holden - with shock comeback single". Mirror.co.uk. Retrieved 8 April 2016. ^ Oakley, Ian (14 May 1999). "Interview 14th May 1999". Fish-TheCompany.Com: Official Site. Retrieved 22 June 2015. ^ Everson, Duncan (12 September 2014). "Interview with Fish (Vocals) (Fish, Former Marillion)". Myglobalmind Webzine. Retrieved 22 June 2015. ^ Astley, Rick. "Vincent (Live)" (video). YouTube. ^ "Madonna celebrates chart double". BBC News. 4 May 2008. Retrieved 22 May 2010. ^ Bestactever.com 10 October 2008. Retrieved 12 October 2008. ^ "US stars scoop MTV Europe awards". BBC News. 7 November 2008. Retrieved 22 November 2008. ^ "The 2009 Time 100". Time. 30 April 2009. Retrieved 22 May 2010. ^ "Rick Astley Returns With Peter Kay". Fame Magazine. 28 April 2010. Archived from the original on 21 February 2016. ^ Halliday, Josh (5 July 2010). "Rick Astley to host Magic 105.4 Sunday show". London: The Guardian. ^ "Magic 105.4 Extends Rick Astley's Show". Bauer Media. Archived from the original on 9 March 2012. ^ "Friday – It's Kay Day!". BBC. ^ "The Chefs Choir Sing "Never Gonna Give You Up" – Red Nose Day 2011". www.youtube.com. Retrieved 29 March 2011. ^ "Celebrity choir sing Take That classic to wrap up Red Nose Day 2011". www.youtube.com. Retrieved 29 March 2011. ^ "Rick Astley releases comeback single Keep Singing 23 years after 'retirement'". Metro.co.uk. 7 April 2016. Retrieved 13 April 2016. ^ Golgowsk, Nina (7 April 2016). "Rick Astley Releases New Single And We Swear It's Not A Rickroll". Huffington Post. Retrieved 8 April 2016. ^ Fitzpatrick, Katie (31 May 2016). "Rick Astley will perform and sign copies of his new album at HMV Manchester". men. Archived from the original on 2 June 2016. Retrieved 2 June 2016. ^ a b "Rick Astley on Twitter". Twitter. Retrieved 9 June 2018. ^ "Rick Roll related Google Trends". Google Trends. Retrieved 4 April 2008. ^ Savage, Mark (1 April 2008). "Rickrolling and the league of web fame". BBC News. BBC. Retrieved 2 April 2008. ^ "YouTube RickRolls Users". TechCrunch. Retrieved 1 June 2008. ^ North, Jesse (27 November 2008). "Macy's Thanksgiving Day Parade: Best and worst moments". Retrieved 15 May 2010. ^ "YouTube – Macy's Thanksgiving Parade Rickroll". www.youtube.com. Retrieved 15 May 2010. ^ "German judge chides Google over YouTube freeloading". The Register. 31 August 2010. ^ "[AMA] I'm really Rick Astley. I swear. And to celebrate my first album since 1993, I'm here to let you Ask Me Anything!". Reddit. Retrieved 8 October 2016. ^ "Photo 29 Lene Bausager and Rick Astley | 78th Annual Academy Awards". Digitalhit.com. Retrieved 22 May 2010. ^ "RICK ASTLEY: 'I'M TOO NICE TO BE A POP IDOL'". Daily Express.